Roman Martyrology: In Genoa, Eugenia Ravasco Blessed Virgin, who founded the Institute of the Daughters of the Sacred Heart of Jesus and Mary, whose care entrusted the education of female youth and the dedication to the needs of the sick and children. Eugenia Ravasco was born in Milan on January 4, 1845 into a noble family and wealthy, healthy principles of Christian, but knew from childhood suffering. In fact, since girl was orphaned by parents, being entrusted to the aunt Marietta Anselmi in Genoa, by uncles who treated her to a great love for the poor and already had in those years as spiritual director Salvatore Magnasco the canon, who later become archbishop of Genoa. Heir to a large fortune, her father was a banker, she was promised in marriage to a marquis, but Eugenia wanted to consecrate the Sacred Heart of Jesus, beginning to lend her work in parishes and hospitals in the city, under the guidance of the priest Giuseppe Como, then the Jesuit Luigi Persoglio. After the death of her sister, in 1868 she hosted at home, with the consent of the vicar of the diocese Bishop Genovese. Magnasco, the “Association for the Good”, whose members would become the Daughters of the Sacred Hearts of Jesus and Mary, the congregation she founded with the aim of creating schools, and workshops for youth, education adolescents, especially the poor children and assistance of the sick. 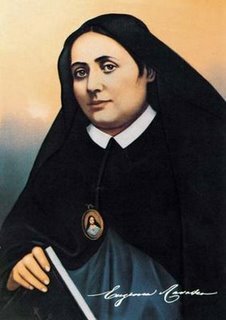 Together with the first 18 sisters, Eugenia Ravasco issued perpetual vows, while with the help of Jesuit Persoglio, she formulated the rules for the institution. In 1882 came the canonical recognition and in 1883 the aggregate came to the Capuchin, bishops and ministers involved in the progression of the Opera, traveled to her, word spread throughout Italy and Europe; she wrote over two thousand letters. She was a woman, who in the melee of historic and cultural change of the second nineteenth century, wanted to promote the status of women, say a true feminist, and the life of the mother Eugenia was all for the Church, young and the poor, drew its strength in the Eucharist, taking as models the Hearts of Jesus and Mary. The nuns of the Congregation of the “Daughters of the Sacred Hearts of Jesus and Mary” are now more than 500. The founding mother died in Genoa on December 30, 1900, was first buried in the cemetery in Staglieno citizen and then subsequently transferred ton the crypt of the House-mother of the Institute. In 1945 the canonical process for his beatification began and finally on April 27, 2003, Pope John Paul II beatified her in Piazza S. Peter’s in Rome. This entry was posted on Tuesday, December 30th, 2008 at 12:31 am and is filed under Beatified by John Paul II, Catholic. You can follow any responses to this entry through the RSS 2.0 feed. You can leave a response, or trackback from your own site.